Each one of us can and must make a difference. The world today has become so chaotic and cold __ global warming, terrorism, corruption, scandals, crime. What we need the most, love, hope, faith and trust are at a premium in society today. It is when Life and nature strike back with a vengeance that we pause in shock, just briefly, helpless and humbled. Only to continue to run this rat race yet again, with blinkers on, conveniently forgetting that we have a social, actually moral, responsibility towards the world we live in! At a personal level we pine, lament, crib about the way things are, even as we wait for someone to lead the way for creating a better world. But we must not wait any longer. Each of us has to make a beginning. Let’s take baby steps. For instance, we can stop using plastic carry bags every time we do our groceries. One plastic bag less for recycling means you have helped Nature avoid 1000 years of biodegradable effort! We can stop watching pirated movies on DVDs or through unauthorized video streaming sites and encourage our kids to do the same. Piracy is nothing short of stealing. Will we encourage our children to steal money? Why then would we allow them to abet the poaching of someone’s intellectual property? We can avoid drinking and driving. Children learn most from their parents. Aren’t we teaching them to break law by drinking and driving or by speaking on our cell phones when we are driving? 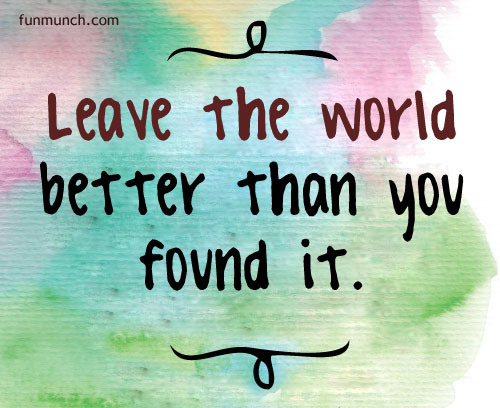 Each of us has a huge responsibility – to leave the world better than it was when we found it. Making simple resolutions to change the way we live and abiding by them can help this cause immensely. Must we wait any longer? Take your first step to making a difference. Each of our small steps collectively can make a giant leap for humankind!